This week, ditch the remote and grab the popcorn with Vimeo Couch Mode and Leap Motion interaction – a whole new way to watch high-quality videos. Plus, a fast-paced speed racer that lives in your browser, magical fireflies, an arcade-style dubstep game, and an elegant wooden puzzle. A world of videos at your fingertips. 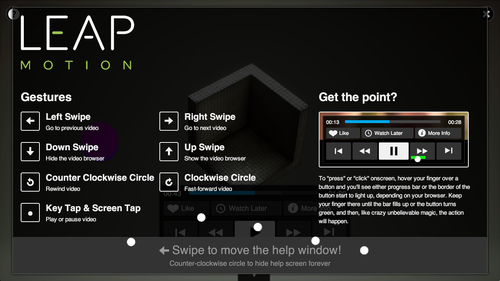 Now you can watch collections of videos on Vimeo with a wave of your hand. Hit play or pause with a tap of your finger, fast-forward with a finger twirl, or change the video with a swipe. Watch high-definition Staff Picks or your own playlist. Blitz through your browser. Control a high-speed futuristic hovercraft in this free web game. Tight corners, blazing speeds, and booster strips – all built in WebGL. We recommend using Chrome for this game. Relax in the serene world of Fireflies. In this magical scene, fireflies are drawn to your colorful fingertips, then change colors and fly away. Don’t just drop the beat – destroy it. DubWars puts the power of dubstep in your hands as you fight waves of flying enemies. Blow them away with lasers and sonic blasts as your weapons fire to the beat. Your only opponent is gravity itself. 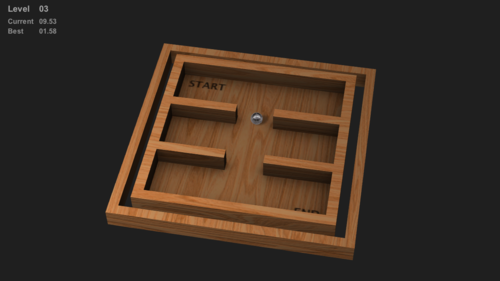 Navigate a small metal ball through various levels in this minimalist puzzle game. TiltYourBall remembers your progress as you play – great for quick, relaxing breaks at work!